These past 40 years have offered me some of the most fulfilling experiences I could have ever imagined. Not only have I had the opportunity to build friendships with so many unique people, but I’ve also been able to help those people significantly improve their quality of life through dentistry. We have been blessed with a fantastic team that always comes to the office with a smile and desire to make our office run smoothly. Everyone in our office is sincerely interested in the people we see. 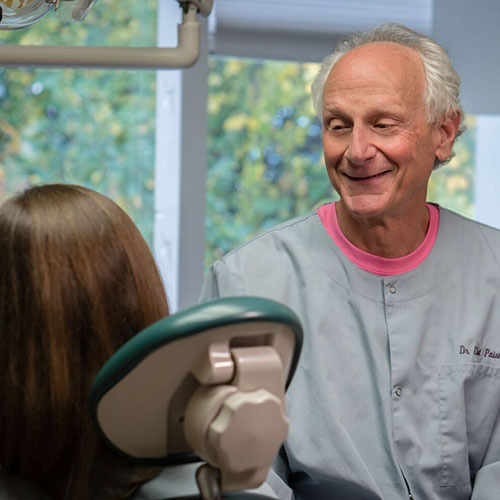 Our patients can rest assured that, at Paisner Dental Associates, they will always be greeted with a smile and treated like family. My career in dentistry began after I attended Tufts University School of Dental Medicine and earned my Doctorate of Dental Medicine. Since then, I have completed extensive continuing education on all subjects pertaining to general dentistry, cosmetics, and advanced technology. I grew up in Dover and have been a proud member of the Nashua community since 1977. I’ve been married to my wife Leslie for more than 40 years. Our two sons, Dr. Michael and Jonathan, have blessed us with five grandchildren between them. In addition to my family and my dental practice, exercise is one of my great passions. Having been a runner for 25 years, I have transitioned to short-distance triathlons.